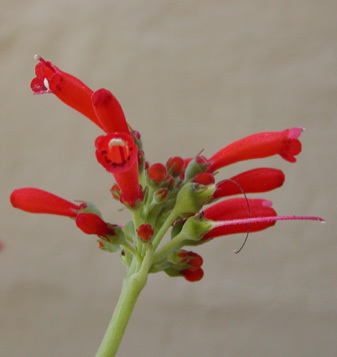 Sinningia macrostachya has a perennial stem base, very stiff leaves, and numerous small orange flowers. 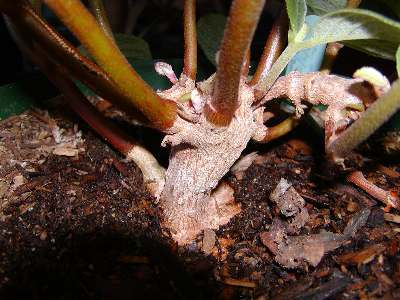 As can be seen in the picture below, the fleshy stems are joined to the woody trunk. Each year, the woody part of the stems extends a little. This can be seen at the right and at the lower left. Jon Dixon got this plant from seed on his S. macrostachya. Dormancy Stem base perennial, gradually extending. Hardiness Has survived 30 F (-1 C) in my yard with no leaf damage. However, 26 F (-3 C) in January 2007 not only killed the leaves, but caused the normally persistent stems to fall off. The tuber eventually sprouted new growth. Recommended? Sort of. The flowers are insularis- or mauroana-small, and not particularly interesting. The leaves are even-more-than-insularis stiff, however. That and the creeping trunk (see discussion above) make it worth growing. Taxonomic group The lineata group of the Dircaea clade. As Gesneria macrostachya by Lindley, in 1828. As Sinningia macrostachya by Chautems, in 1990. Etymology: macro- ("large") + -stachy ("stem").